I’d had this book on my shelves for years. It has moved house with me approximately four times. I couldn’t tell you what finally made me decide to pick it up and read it but I can tell you that I’m glad that I’ve read it…so that I can give it away and clear some room. Disappointing. For me, there’s something darkly fascinating about criminal insanity. Maybe we all start out the same; maybe we don’t. Maybe it comes down to our experiences or our development. Or maybe criminality is innate and just lies dormant in people until some…spark. Call me morbid, but I could debate myself round in these circles for hours. Perhaps its a throwback to a Modern Legal Theory module I took back in university. Whatever it is, it lead me to expect too much from A Plea of Insanity. That’s not to say that I expect every psychological thriller to be a thesis on criminality but if you choose a psychiatrist for your protagonist and a mental hospital for your setting, I do expect a little more. 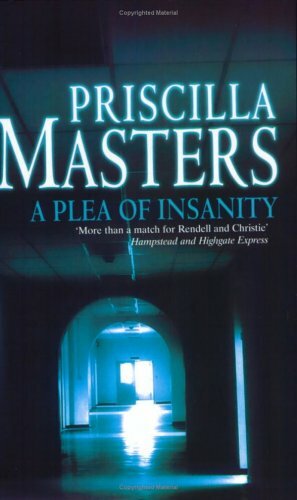 So Dr Claire Roget takes up a position at a secure psychiatric unit shortly after her predecessor (and idol) was brutally murdered in the very same office. The earlier parts of the novel are clearly and sympathetically written. Dr Roget struggles with living in the shadow of Dr Faro while trying to get to know her patients. The glimpse into the world of an over-stretched publicly-funded institution and the inevitable pitfalls is initially well-handed. After the first few atmospheric chapters, though, the strengths deteriorate and the book just made me feel…sad. There’s a lot of criticism of the state of our mental welfare system, some of which may be well founded but a lot of which seems sensationalist. Dr Roget herself is unprofessional and complains regularly about the patients that she is supposed to be caring for. The first time she meets Jeremy Barclay, the apparent malcontent of the book, she is so hyper-sensitive that she indulges her imagination. I appreciate that he’s creepy, I really do. Which is but one of the many reasons that I am not a doctor trained to deal with the criminally insane. The lack of respect and understanding that Dr Roget displays for her patients made me lose all sympathy for her. After that, the book didn’t hold much appeal. Oh, and don’t even get me started on the romantic side-plot. Plus sides? There’s a fair “Whodunnit” element for most of the book and some appropriately creepy moments. Overall: A solid idea, poorly and prejudicially executed. The denouement by no means makes up for the damage done along the way and I’m sure that there are far better psychological thrillers that you could spend your time on.